Have you ever done it on a plane? Had an anxiety attack, that is? Picture it. Mother’s Day 2015. It was a rough flight back to Kansas City, lots of turbulence; stomach-lurching, panic-inducing dips and bumps that made it feel like the oxygen masks would drop down any minute signaling imminent doom. Instead of taking a Xanex like a good little puppy, I tried to tough it out by closing my eyes and drifting off into a place somewhere between sleep and denial. I had just dozed off when all of a sudden I was roused by an urge to vomit. I grabbed my trusty barf bag from the seat-pocket in front of me as my mouth and eyes watered. My husband hastily encouraged me to try to make it to the lavatory. Reluctantly I stood up and made it about five wobbly steps before my vision blacked out and I fainted, collapsing into the arms of a very astute flight attendant with cat-like reflexes and man-like strength. I imagine what was going through her head as she saw me, pale and disoriented, weaving up the aisle, “This is it, Karen. This is what you’ve been training for. Damnit Karen don’t blow this…not again…not like Lubbock.” In her mind, the crew all rooting for her, pumping their fists, shouting, “Ka-REN! Ka-REN!” as she set her jaw and headed toward me, arms-outstretched, the whole scene playing out in slow motion as she grabbed me, snapping me back to consciousness. I spent the majority of the rest of the flight in the front row next to a blind man and his sweet service dog. The flight attendant offered to have an ambulance waiting for me on the tarmac but I assured her it wasn’t necessary, although at the time I had sweat through my T-shirt and was sitting with my head between my knees clutching a fresh barf bag so I’m not sure how convincing I was. I was glad the blind man couldn’t see me but I was concerned about what he (and the dog) could smell at that point. One perk of this is that the flight attendant told me I can request special pre-boarding due to my condition so I can always sit in the first row. She also added, “and you don’t have to explain your condition to them,” which I thought was slightly judgey, but you know how Karen is. So dramatic. So I guess you could say I joined the Mile High-Anxiety club. I’m thinking more and more about doing these T-shirts. Who wants one? I’ve done it on an airplane! 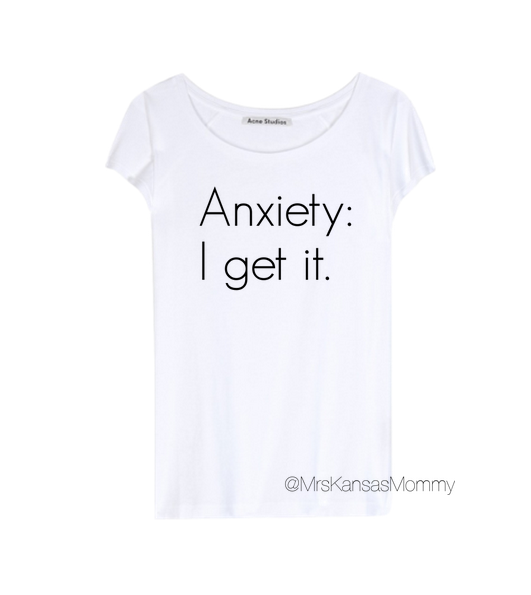 Anxiety…I do get it. I’m sorry you had trouble.